She loves the boots and they arrived in time for the game. I really appreciate your willingness to jump in and help get this straightened out. 3D Belt Company Tan Bible Cover with Tooled Crosses on the Back that Accommodates Bibles or Books 7 3/4 Wide X 10 1/4 Tall by 2 Inches Deep or less. 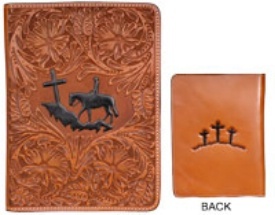 3D Belt Company Tan Bible Cover with Tooled Crosses on the Back that Accommodates Bibles or Books 7 3/4 Wide X 10 1/4 Tall by 2 Inches Deep or less. This 3D Bible cover also features a Tooled Body with Tooled Cowboy with Cross. 3D Belts offers quality products at fair prices, get this cover for the Sale price of $69.99 a bargain indeed. Accommodates Bibles or Books 7 3/4 Wide X 10 1/4 Tall by 2 Inches Deep or less.